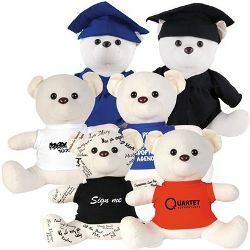 27cmH calico sitting signature bear choice of Black, Red, Blue or White T–Shirt or Graduation Gown and Cap. Printing: Price includes 1 colour 1 position print on T–Shirt. White print recommended on Blue or Red T–Shirts. White, Silver print recommended on Black T–Shirts.